It was the last night in the Big Brother 2014 house for Frankie Grande, so I had to share one last picture with everybody before the season comes to an end next week (how crazy is that)! The HGs got some alcohol and Derrick started to get a little ticked off with everyone. The HGs have an early morning today, so it was an early night for them on Big Brother 16. Check out the highlights from Sunday below in our Big Brother 2014 spoilers! The HGs were up early (early for this season’s standards). The Veto Meeting took place and Cody did not use it, so Frankie and Victoria remained on the block for Week 12. To talk about the delusions, Caleb talked about being okay with taking third place because he will win America’s Favorite Player. 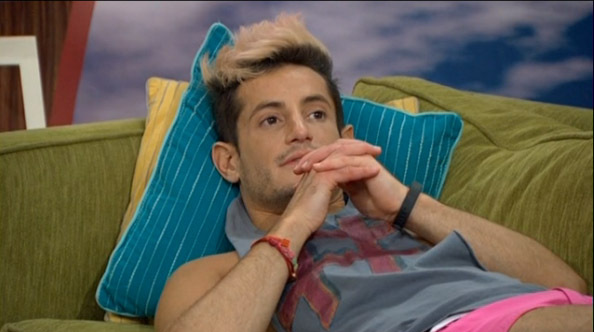 Frankie has been trying to work Caleb the past couple days and not sure why, especially since he has no vote. He is telling him that Derrick has an “impeccable social game” and the jury does not hate him. More delusions from Caleb, as he counts jury votes and he knows that Victoria, Jocasta, Donny, Hayden and Nicole all hate Derrick. Ummm, it would be the opposite and those votes alone would give the win to Derrick! Derrick is getting ticked at Frankie for these talks and he wants to blindside Frankie with the eviction this week. Caleb and Cody want to tell him, but right before the eviction happens. This is a topic of conversation throughout the day and they almost told him last night, but no luck! We probably won’t see the conversation since feeds go down sometime today! The HGs got an alcohol delivery and Victoria got a little messy! Derrick was paranoid, as he was worried she was going to slip some private information. He was not a happy camper, but avoided anything bad happening. They were the last two up and he continued his “the jury hates me” talk. Frankie is the only one who doesn’t seem to believe that, but he is out the door and doesn’t matter now. Also, Derrick and Cody were talking about how to handle the Caleb situation. He will be the next one gone, unless he wins veto since he can’t compete in the HoH competition. They are assuming that Derrick or Cody will win HoH, but how fun would it be if Victoria won? They talked about putting each other up with Victoria and then not ticking off Caleb if he wins veto. He would be the lone vote and they want to make sure it goes to Victoria, so could be smart thinking. The HGs don’t know about the special eviction today on Big Brother 2014. They were told to wake up early, as they will be taping some footage to use on BBAD tonight. They think it will be used later in the week. They were also told to look nice, so they think they are getting a special visitor today, but it really will be a special goodbye to Frankie! So, the live feeds will go down sometime today for the eviction and won’t come back until Tuesday night after the show airs on the West Coast. I thought it would be Wednesday’s show, but I was wrong. When they come back, we will know a ton of info and spoilers, like who won HoH and who is on the block and who won veto. They will have a lot going on after that eviction, so these HGs are in for a couple busy days! Todd, i’ve read that once the feeds come back up Tuesday night and we learn who HOH is that they will go down again and we will not know who the noms are or veto winner. And won’t know until Wednesdays show. I’m hoping they don’t block us from knowing (and i don’t know why they would) but that’s the talk. Then again … that middle finger keeps pointing at the superfans and feeders…. I hope it isn’t true, but nothing would surprise me! Looks like TAR starts here in the US on 9/26 at 8, we have Survivor also that week starting on the 24th along with The Black List and The Voice on the 22nd. Finally something worth watching. Live feeds are not live feeds – I see more fish than people. I have watched from day 1. Last year started me disliking the show. It use to be fun! The BB Canada Live Feeds are free. Rumors and speculation abound on the web. But as you say…who knows what they might do. Yeah, I just don’t know what is true and what isn’t. I am waiting (not patiently) to see it play out! Heck yea I would love to see Victoria win HOH now that would be funny as heck. Those boys would be squirming in their pants. I would love that too. I do want Caleb to go as well. He can then get his America’s favorite player. NOT!!! Caleb has rambled on and on about how he will spend his winnings. He of course is assuming he will win AFP and possibly be in F2 if not the winner. He has no clue that taxes have to be paid on it. Or that he will NEVER win AFP. He is also still waiting for his big truck to be delivered. And he probably expects Amber to be driving that big truck! He will never see that truck unless he comes back to the real world and gets a real job. That’s the one thing I’ve been waiting for all season. I was so looking forward to seeing Frankie bouncing through the door with a huge smile on his face which turns to horror as the audience boos him out of the building. Yea and I also wonder how he will treat Julie, we have all seen him during the evictions, how he is always giving her a heart etc. Oh God. Didn’t think of that. He’s going to drool all over her. T-Bird he will see how the outside sees him after the show. Also the Finale they can not stop them from the booooooooooooooooo, Frankie will soon learn that most of America can not stand him. I thought there is a show on tuesday / wednesday and the a special one on friday this week? Has there been any more info on whether there will be fan favorite this year? Not that i know of. It’s usually not announced until the last week of the show. If they have it, it should be announced on Wednesday’s show and give us one week to vote. Yesterday Frankie says they DESERVE another luxury comp, because he was ripped off by the jury in the first one. Doesn’t know why the jury deserved anything. I am soooo over him. Plus begging for sisters fans to vote him fan favorite. Well, they deserved a reward for having to be in the BB house with Frankie! He particularly named Jocasta as undeserving. Guess he forgot about her help in holding a memorial to his Grandfather. Ungrateful. Frankie’s sister seems to be quite the diva. I’m hoping America steps up and votes AFP to the one who deserves it. DONNY! LOLROTFLMAO, Very, very funny Carol. Love it! Gm Joyce, I am glad I made you smile. Have a great day. I liked last nights episode with the Jury tearing up the house! Quite fitting. I for one will take to social media to try to garner votes for Donny for AFP once it is announced! While I like Nicole and Zach, Donny is the only one I will vote for. The biggest blindside in this entire season is about to go down when funkie walks out that door and we don’t get to see his face when he is Booed , is not fair!! That’s going to happen next is so easy. Derrick can start counting his cash! Vic will be sitting beside him and the rest will be wondering where their reality shows are. Hahaha! Still America’s favorite : Donnie. !!! yeah the biggest blindside was to us fans this season! I really don’t consider Frankie’s eviction a blindside since they really have no other choice at this point because they can all beat Victoria. Yeah, Tuesday’s show is an eviction show, but taped. Wednesday’s show is a live eviction. Good Morning, all! Whats the latest with the live feeds? Did they go down last nite for eviction as you predicted?